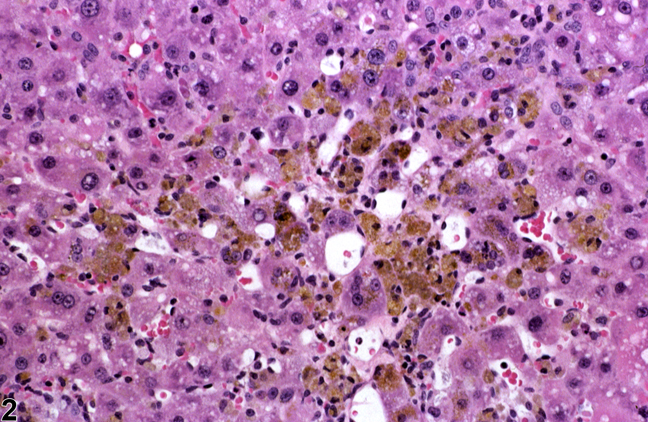 Pigment in hepatocytes in a male B6C3F1 mouse from a subchronic study. 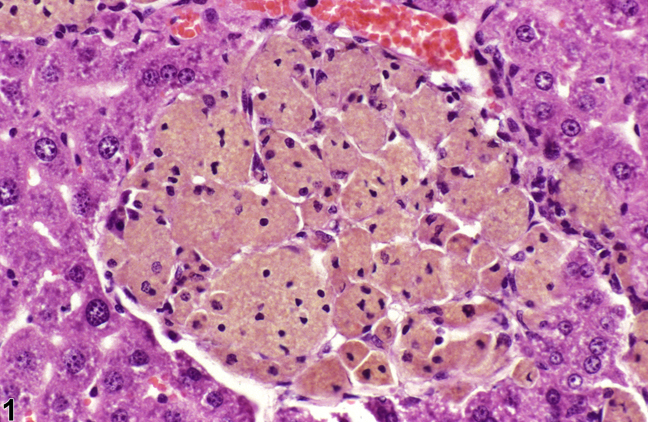 Pigment in hepatocytes in a male Harlan Sprague-Dawley rat from a chronic study. 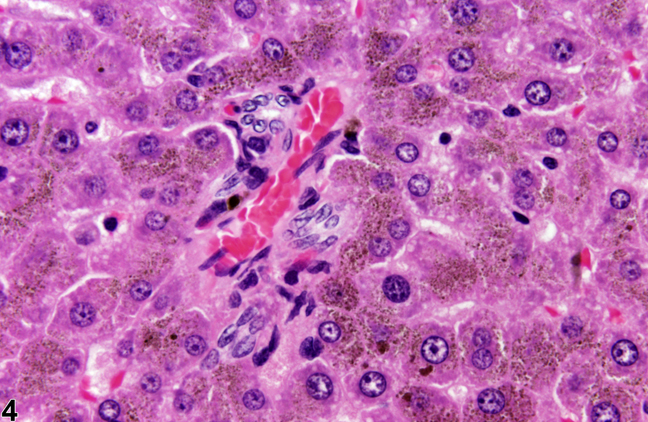 Pigment in hepatocytes in a female Wistar Han rat from a subchronic study. 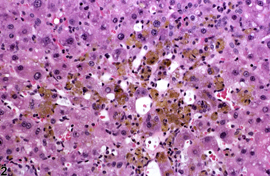 Both endogenous and exogenous pigment can occur in hepatocytes, but pigmentation occurs more often in Kupffer cells. Pigment may be prominent in portal areas. 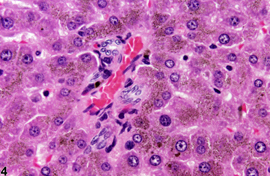 Identification of hepatic pigment typically requires multiple special stains. Different pigments frequently contain some iron and will thus have variable positivity with Prussian blue stain. In Figure 1 , pigment is deposited in clusters of aggregated Kupffer cells, which was given a severity grade of 3+ (moderate). 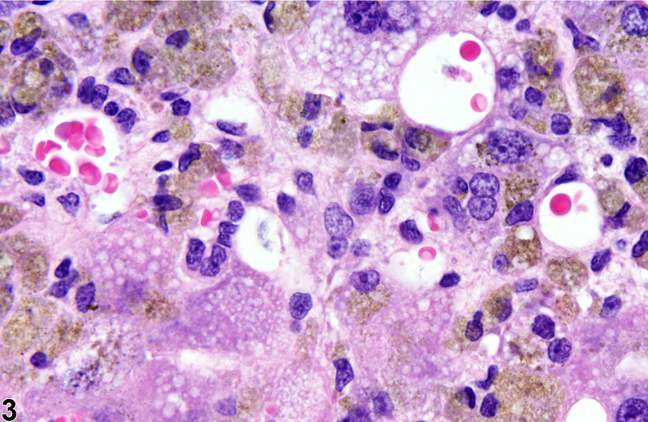 Figure 2 and Figure 3 show evidence of pigment deposition in Kupffer cells as well as in hepatocytes. The pigment deposition is primarily centrilobular and was given a severity grade of 3+ (moderate). 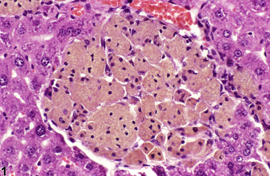 In Figure 4 , the pigment deposition is primarily within hepatocytes and has a panlobular distribution. Definitive pigment identification is often difficult in histologic sections, even with a battery of special stains. Therefore, a diagnosis of “pigment” is most appropriate. The pathology narrative should describe the morphologic features of the pigmentation, the lobular distribution, the cell type affected, and any accompanying histologic changes that might be associated with the pigment deposition. The pathologist may also speculate in the pathology narrative as to the type of pigment present. A severity grade should be assigned based on the relative amounts of pigment present.